He has spoken to the world from the biggest stage. Now book him on yours. As the first Canadian Commander of the International Space Station, Colonel Chris Hadfield has had the type of career one can only dream of – just like he did as a child watching the Apollo 11 moon landing. As a metaphor for pursuing our dreams we’re often told to reach for the stars and Chris literally did it. The commitment, intelligence, sacrifice, and hard work that allow him to achieve his dreams have taught him some valuable lessons over his 20+ year career – and have left him with some incredibly riveting stories and advice to give. Now he wants to share his experiences. In his passionate and inspiring talks, Hadfield imparts the useful and practical lessons he’s learned throughout his remarkable career – in the fields of leadership, teamwork, collaboration, science, and technology – in space and on Earth. Chris is available for speaking engagements all over the world. 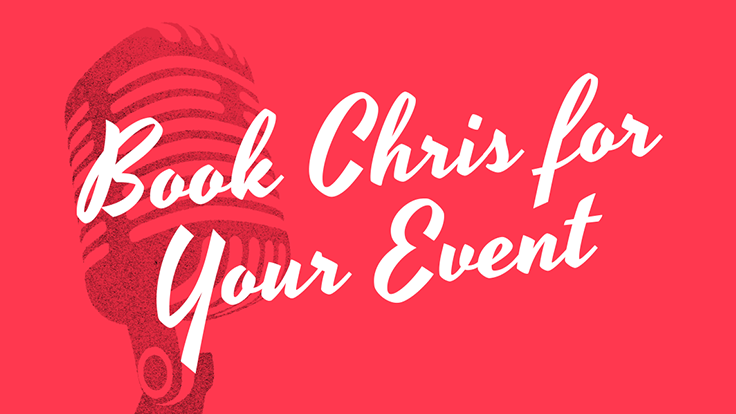 Book Chris for your next event! Stepping out to attend this event has given me an experience I will remember for a lifetime and perspective to keep dreaming of what could be. Thank you twitter for bringing this to my attention but thank you real-world, Space Commander Chris Hadfield for waking up my inspiration. I can't thank you enough for making it possible for us to host him – he brought a profile to our work that we haven't had in years! Your amazing experiences, perspectives, photos and lessons learned were inspiring for the more than 1,000 delegates in attendance. Your comments reminded us of how lucky we are to be Canadians, and to live on this planet. I don't know how many photographs he posed for, how many books he signed, how many hands he shook but he won the crowds of people he met whether they were the rehab patients or war veterans at the hospital, or the 1250 guests we had at the dinner. The event went very well last Thursday and the true highlight of the evening was Chris’ speech. He did such a wonderful job of connecting his own personal experiences to C-DAAP and their goal of being able to support dressage athletes and help them realize their dreams. We'd work with him again on any project in mili-second and would highly recommend him to anyone who is considering booking him. Our annual Safety & Quality Summit includes a Gala Dinner at which he have been privileged to have many well-known and highly entertaining guests; this year, we were honoured to have Chris Hadfield as our special guest and I have to say he excelled all of our expectations, and more. An enthralling story, masterfully delivered with style and humour, and supported with breathtaking images. Chris’s commitment to provide a once in a lifetime opportunity for all of our guests was truly selfless and much appreciated by all who benefitted from what was a fantastic evening. The event was outstanding and your help with organizing Chris Hadfield’s speaking engagement was professional and very appreciated. It was the best event we have ever held. Chris and Evan helped to make the event stress-free, being so calm, kind, and friendly, open and attentive to us, our students and guests both before and after the event. They were a pleasure. It goes without saying that Chris’ presentation was beyond wonderful. Inspiring, humorous, insightful, surprising. What a shining example of leadership he is for all of us. We were thrilled to have him in London. I have to tell you that Chris Hadfield is one of the finest guests we've ever hosted in our organization. He and Helene were just exceptional in every way. They intuitively knew how to engage with other people and went out of their way to ensure everyone had the chance to meet with Chris. ‘Thank you’ seems too meager words for the impact that Colonel Hadfield’s address had on our staff on March 6th. Colonel Hadfield inspired each and every staff member. The way he was able to draw in the audience and intricately weave his experiences into what we are living as an organization was impeccable. There was a palpable buzz around the office on Friday and even today. What a wonderful experience for all of us. It was an absolute pleasure to have Chris here at The Arden Theatre in St. Albert, AB. He was incredibly gracious and our audiences really appreciated him taking the time to meet everyone that stayed for the book signing after each presentation. It was certainly a memorable and inspiring day for many of us staff members as well. Hopefully one day in the future we can host him again. Chris — on behalf of Kubota Canada Ltd., is employees and it’s dealers across the country, we are honoured and thrilled that you were able to be part of Kubota’s 40th Anniversary celebration at our National Dealer Meeting last week in Atlanta. Thanks for your multiple messages of inspiration. Many people mentioned to me that your strategy of “planning to fail” gave them a new way to look at our they might build their business strategies. On a personal note, thanks for tailoring your presentation to our Kubota group and connecting on a familiar level, equipment. As mentioned above, the message was received!